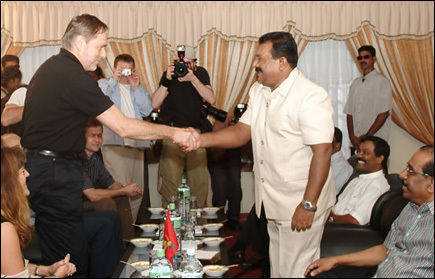 Leaders of the Liberation Tigers of Tamil Eelam (LTTE) Saturday requested the Norwegian government delegation led by its Foreign Minister Mr.Jan Petersen to ensure that the northeast region received equitable proportion of the international aid Sri Lanka is expected to receive in the aftermath of tsunami disaster. In the NorthEast region about seventy five thousand families have been affected and around 25,000 have lost their lives, the Norwegian delegation was told, Vanni sources said. 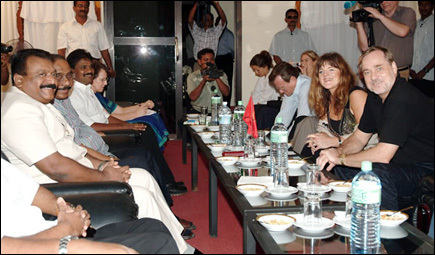 The high level Norwegian delegation led by Mr.Jan Petersen, met with Mr.V.Pirapaharan, leader of the Liberation Tigers of Tamil Eelam (LTTE) at the LTTE Peace Secretariat and held discussion for about two hours which centred mainly on the foreign aid to the rehabilitation and reconstruction of Tsunami hit coastal areas in the northeast, Vanni sources said. LTTE political strategist, Mr.Anton Balasingham, LTTE political head, Mr.S.P.Thamilchelvan, Special Commander of the Sea Tigers, Colonel Soosai, and Head of the Thamileelam Police, Mr.P.Nadesan, participated in the discussion along with Mr.Pirapaharan. Minister of International Development, Ms Hilde Frafjord Johnson, Deputy Foreign Minister, Mr.Vidar Helgessen, Norwegian peace envoy, Mr.Erik Solheim, and Norwegian Ambassador to Sri Lanka, Mr. Hans Brattskar accompanied Mr.Jan Petersen to the discussions. Later Mr.Anton Balasingham and Mr.Thamilchelvan held a press briefing at the headquarters of the LTTE Planning Secretariat. Mr.Anton Balasingham said: "Our leader Mr.Pirapaharan has brought to the notice of the Norwegian delegation that the international aid coming to the country due to sympathy following Tsunami disaster is being misused by the Government of Sri Lanka (GOSL). Our leader has pointed out that the GOSL has taken steps to purchase arms from Iran at a cost of 150 million US dollars. This act is considered as an attempt to tilt the balance of military power." "About seventy five thousand families have been affected in Tsunami in the northeast and around 25,000 have lost their lives. This number includes all three communities Tamil, Sinhala and Muslim, in the province. Hence the international community should ensure equitable distribution of aid to the affected people and the areas. We appealed to the Norwegian government to enlighten the international community that northeast province has suffered the worst in Tsunami that hit the coastal belt of Sri Lanka," said Mr Balasingham. "Our leader has appealed to the Norwegian delegation not to forget the peace process in the midst of Tsunami disaster and related relief and rehabilitation measures. The international community that has turned its whole attention on the Tsunami disaster should also contribute constructively to find an acceptable political resolution to the three decade old war that had devastated the northeast and rendering hundreds of thousands displaced," said Mr.Balasingham. Mr. Balasingham said though the discussion did not give more emphasis on the current peace process, but the LTTE leader told the Norwegian delegation that reconstruction and rehabilitation programme of the Tsunami destroyed country should be implemented in such a way to build confidence at the national level thus contributing to the peace building in the future. "Tamil Rehabilitation Organization (TRO) is engaged in providing relief and other assistance to Tsunami victims in the northeast but the government is using the State armed forces to intimidate TRO volunteers from serving the people. How can the government expect us to join it National Task Force formed to provide relief and other measures?" asked Mr Balasingham in reply to a question by a journalist. 04.01.05 PDS gears for phase two & three of tsunami relief in Northea..